Luthiers construct instruments out of many different tonewoods, and each of them has their own characteristics that make them look and sound unique to one another, and sometimes even be more expensive than others. While the woods that a guitar’s body are made from can be quite diverse, the guitar fretboard wood types can be narrowed to just three main ones with some subtypes. Each of these fretboard woods will be discussed in this article to help you learn about how they sound, as well as being able to identify them by sight. This will help you make an informed decision when buying a guitar. What Are The Different Types of Fretboard Woods? What’s The Best Guitar Fretboard Wood To Pick? Is The Fretboard Tonewood More Important Than Other Parts? Sometimes there is a bit of confusion with beginners regarding neck and fretboard. The most common mistake is calling the guitar’s fretboard the neck – essentially lumping them both together. In reality, they are two separate pieces of this puzzle. 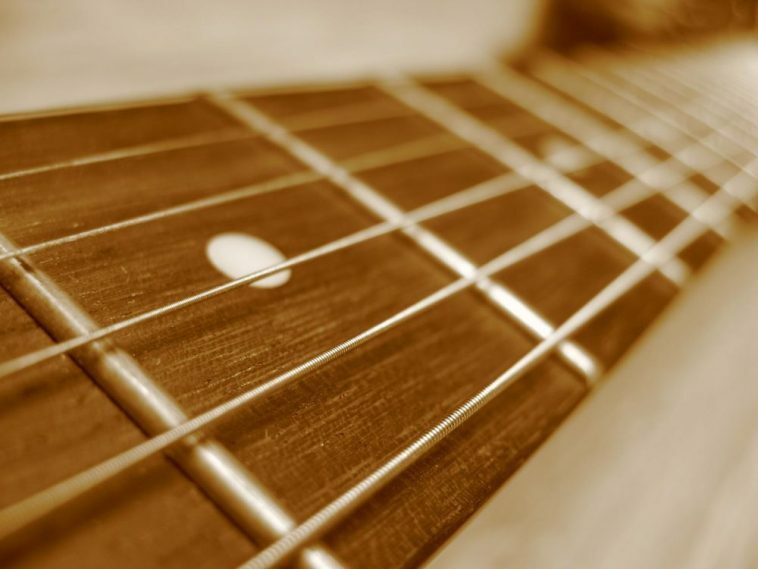 A guitar’s neck is typically made from either maple or mahogany. Maple is more common than mahogany though because maple tends me to regarded as a bit more reliable. For example, because mahogany is softer and more porous, it can be negatively affected by the climate. A guitar humidifier is extremely helpful for all guitars, but instruments with mahogany necks might benefit from them the most. The fretboard can either be glued into place onto the neck, or it can be a one-piece. You’ll most commonly see rosewood and ebony fretboards glued on, but one-piece maples are also the norm too. 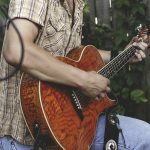 This information might not be as relevant when buying a guitar for a beginner or for yourself for the very first time, but it might come in handy when you start looking for a second or third guitar after you’ve become more experienced and start to figure out what you really like. These guitar fretboard wood types do make a difference in how they play and sound and should be considered when making a purchase. An assortment of different kinds of guitars and fretboards. Whether one type of fingerboard wood is better than another is entirely subjective – each of them has certain qualities that may be more pleasing than others. I personally think all of them are special and think they all deserve a place in a collection. However, if you’re on a budget, you should get acquainted with each of them. In this section, I will discuss the characteristics of guitar fretboard woods that I have learned over the years. You can find rosewood in just about every type of guitar – electrics, steel-string, and classical, you name it. It is widely available, not only because it is quite cheap (not in a bad way) but it produces a tone that can be described as warm, rich, and balanced (deep lows and bright highs). Some may even describe it as relatively mellow. It is also a heavy and sturdy wood, which makes it a popular choice among guitar manufacturers. Nowadays, the most frequently used type of rosewood has been Indian Rosewood, which is readily available. This contrasts with Brazilian rosewood which is rarely used now because of exploitation. It had been used for furniture exports, and overlogging has led to conservation efforts. It is hard to find a guitar with Brazilian rosewood, and if you do, it’ll probably cost you big bucks. Regardless, Indian rosewood has been a great substitute for decades now. I’ve owned many guitars with rosewood fretboards, and my beloved Ibanez Prestige has one, so despite Brazilian rosewood being banned, Indian rosewood is still used on high-quality instruments from Ibanez and other guitar manufacturers. While I love the feel and sound of them, I also appreciate the aesthetic of maple fretboards! They compliment so many different colors and shapes. If you are familiar with Fender guitars, I believe most of them use a maple fretboard, with rosewood coming in at a close second. Either way, they’re pretty iconic. Guitars can use both hard and soft maple, but for necks and fretboards, it’s almost always hard maple, which is dense. The best way I can describe the sound of this type of fretboard wood is that it sounds like it has a lot of “bite” and “snap.” It is very bright, which is probably why they were so often used for twangier tones. However, if you’re looking for a metal guitar, don’t let this discourage you – maple fretboards have been used by great guitarists in this genre for years. It just sounds different than rosewood. Two guitarists I can think of right now that used maple fretboards to great effect are Dave Murray from Iron Maiden and Yngwie Malmsteen. 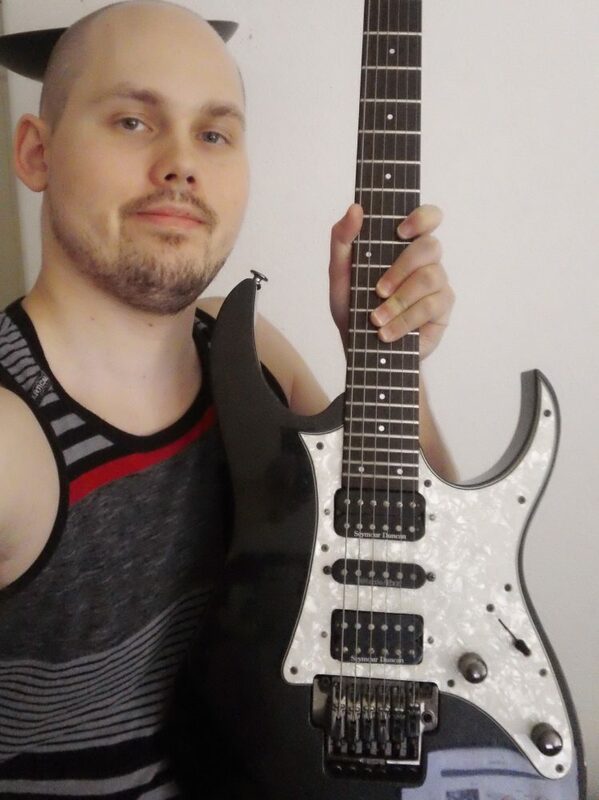 In fact, the guitar with the greatest feeling one-piece neck and fretboard that I’ve played was on a Charvel So-Cal, which is a lot like a Fender Stratocaster, but beefier. The maple fretboard combined with the compound radius made the guitar feel so fast and buttery-smooth. Out of all of the three main guitar fretboard wood options, ebony is not nearly as available as rosewood or maple. However, it is still not exactly rare. What gives? Well, first of all, it’s probably one of the more expensive woods out there. I usually see ebony on electric guitars that are over 1000 dollars or on some steel-string and classical guitars. I have an old Ibanez bass that has an ebony fretboard, and it does have a different feel to it. I and others would agree that ebony kind of has a “slippier” feeling to the fretboard, while also being one of the toughest and densest woods. Ebony’s tonality sounds closer to the maple fretboards – bright and snappy, while still having the dark aesthetic that is similar to rosewood, albeit noticeably darker and less grainy. Because of this, some guitarists may mention that it’s kind of like a hybrid between the two. An ebony wood guitar fretboard will require the same care as a rosewood one, that’s for sure. If you’ve never seen a guitar with an ebony fretboard, here’s an Ibanez guitar that has one. Take a good look at it, and compare it with the one from earlier that has a rosewood fretboard. Notice how much darker it is! It looks awesome with a lot of guitars, and it won’t be long before you can easily point out an ebony fingerboard. As you can see from this list, there is a variety of choices, and that’s not even all of them. I’m sure I’m missing a few. Each of them has attributes which I will more than likely discuss in a future guide. A couple of them are even the same woods that are used for fretboards! 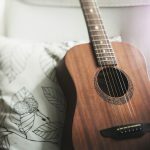 If you are a beginner or an intermediate player, I recommend checking out some different guitars and making a note of what you like the most. It can be difficult and almost feel impossible to tell what a guitar is constructed from with an untrained eye and ear, but luckily a guitar’s fingerboard wood is a lot easier to identify. Find some guitars that you think feel and sound great and try to find what they are made out of. Compare it with other ones. As mentioned before, a lot of this is subjective, and there is no best guitar wood. Yes, some are rarer and more expensive than others, but it doesn’t always translate to a better sound. It’s all about figuring out what you like! 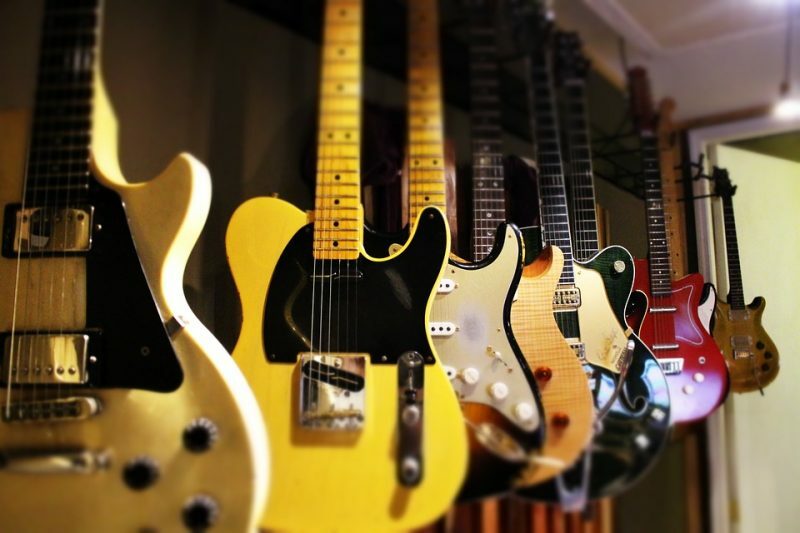 Buying a guitar can be a little hectic sometimes if you don’t know what you’re looking for. 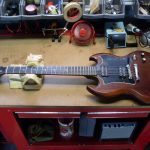 Wood is something that isn’t always considered if you are going to pick up your first guitar, which is understandable, but if you ever plan on getting another one in the future, it is useful to know a little bit about what separates guitars apart, other than brand, shape, color, etc. All of these woods are wonderful in their own right and should be given an equal chance when buying a guitar. I honestly don’t think there should be any debates regarding rosewood vs. maple fingerboards, because they are both great. Although I’ve mainly owned guitars with rosewood fingerboards, I love maple ones too and hope to hold a new one in the future. As for an ebony wood guitar fretboard, I have a bass guitar with one, and I like it very much. Like I mentioned in the previous section, be on the lookout and check out some guitars and find some that really catch your eyes and ears. Be mindful and find out what materials they are constructed from. You’ll probably always have a favorite, but always remember that you never have to settle on just one type of wood. Between body and fretboard woods, there’s a lot to pick from. Hey, I’m Mike! As a guitarist for over 15 years, I’ve decided to combine my passions for music, writing, and teaching all into one outlet – GuitarMeet. I love talking about music gear and sharing what I know with others. I appreciate all genres of music, but metal will always be #1!